My life is always filled with distractions. So much so, that I find it difficult to figure out exactly what I shoul d be paying attention to. I have the attention span of a flea, so anything can distract me! I think most people can relate because it seems like our entire society has a type of A.D.D. In our technology-driven world, there are endless options of what can pull our focus from what is in front of us. This can be very concerning. Especially since every day on my way to work I have people pass me with their head buried into their phone, texting or looking at FACEBOOK. In this life of distractions, I am convinced that we are in risk of missing out on the greatest events in our life. How do we re-gain the focus on what is important? Focus is important as we pursue our lives. It is too easy to become distracted by chasing the big-picture stuff and miss the smaller, more significant issues that are probably more important. One distraction leads to another, which leads to another, and before we know it, we’re off course and we wonder how we’ll ever really experience the life we were intended to live. 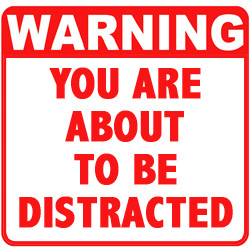 I’ve discovered some of the distractions that I have experienced might possibly be God interruptions. Say what? Yes… some distractions, I believe come from God. 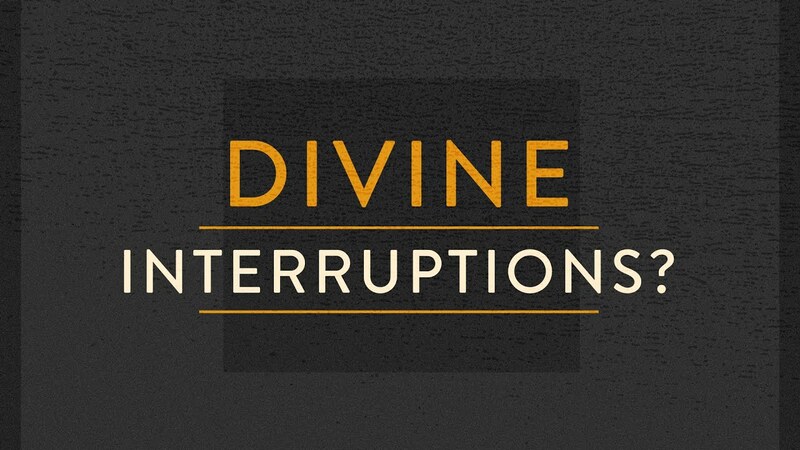 Yes, a “Divine Interruption” if you will. The are intended to get our attention. They might be God’s way of leading us into an important new piece of the puzzle in His ultimate plan for our life. What feels like an interruption in one moment can be the key to unlock another direction God wants us to go. It’s knowing when God is nudging you or whispering in your ear. I believe God uses these nudges to move us, to help us gain perspective and re-focus on things that are important. Unfortunately for me… sometimes God tried nudging until He had to slap me alone the side of the head. There have been many times I couldn’t take the hint that God was leading me to. I have never handled interruptions very well. I am too busy making my own plans. I can’t help but marvel at how Jesus handled interruptions. A few weeks ago I wrote about John The Baptist, a story told in Matthew 14, when Jesus finds out about John the Baptist’s beheading. Jesus is saddened by the news. He wants to be alone. So what does He do? He gets in the boat and sta rts on a journey to get some solace and relief. But Jesus’ solace is soon interrupted. A large crowd gets word of His plan, and the people make it to the other side in order to wait for Him. Imagine Jesus as He nears the shore and catches a glimpse of thousands of people waiting to meet Him. Most of us would be frustrated at the sight. We’d probably decide it best to send away the crowds. Or maybe we’d stay in the boat and go somewhere else. But that’s not Jesus’ response. He’s not frustrated. Matthew says he felt compassion for the people. Yep. While I’m busy figuring out a way to do my own thing, Jesus would be thinking of how He could show compassion. He doesn’t throw a pity party for Himself. Instead, He puts others first. What would stir up frustration in us stirs up compassion in Him! Jesus was always available for interruptions. It always seems to me that whenever Jesus was interrupted a miracle followed. He seemed to keep Himself open so He could turn what looked like a distraction into the gateway to a miracle. Have you ever heard about the day Jesus was teaching and some parents took their children to Him so He would pray over them and bless them? The disciples scolded the parents for bothering Jesus; they saw the children as a disruption. He recognized the opportunity to teach His followers about the kind of faith they needed. He knew difference between distraction and divine interruption because He stayed close to the Father, listening for and following God’s plan. Divine Interruptions are not obstacles to our plan; they are opportunities for us to embrace God’s plan. God never promised that this life was easy. If we focus only on the mess of this life, we may just very well miss the miracle God has for us. I’ve missed too many miracles. I’ve missed too many blessings. I’ve missed many aspects of the life that God wanted for me because I was to focused on “me” and my desires. I believe we need to allow ourselves to be open to Divine Interruptions. God is constantly crossing our path, canceling our plans and sending interruptions in our life to create the change that God wants for us. When we experience these events… these Divine Interruptions, we think that our life is in total disarray and totally falling apart. Truth is… if we allow God to do His work… it might finally be falling into place.